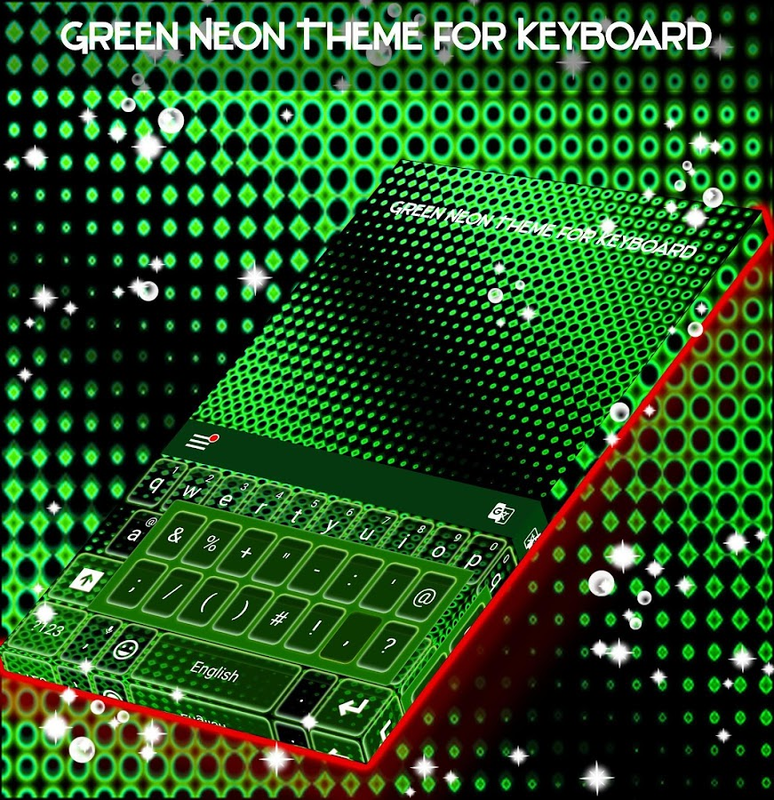 If you are more of a neon shades lover, this might be just what youwant: Green Neon Theme for Keyboard! 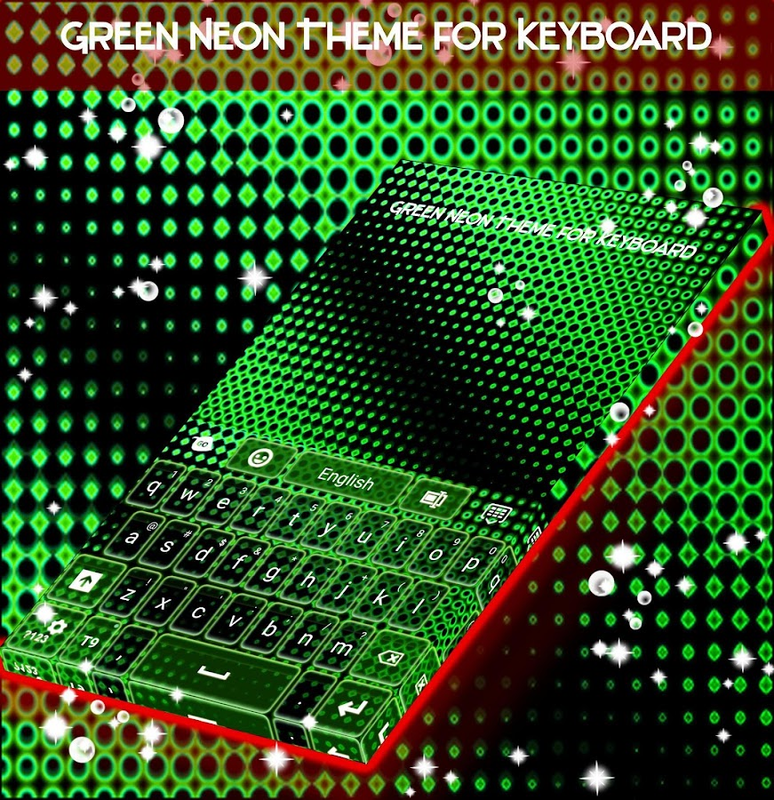 DOWNLOAD Green Neon Theme forKeyboard now and enjoy these green vibes!★★★ The new Green NeonTheme for Keyboard will change the background of your keyboard witha unique design and amazing color. With keyboard themes for Androidyou can personalize the smartphone keyboard. Try one design and seehow new keyboard themes can transform your phone!★★★★★★You can seehow this theme looks in the HD screenshots we added. This is one ofthe keyboard themes for Android that is compatible with mostsmartphone versions and will look amazing on your Androiddevice.★★★✧ Give your standard keyboard a new look ! This keyboardtheme will change the look and shape of the keyboard buttons, sonow it is easier to write.✧✧ Get this keyboard theme and startusing it instantly! 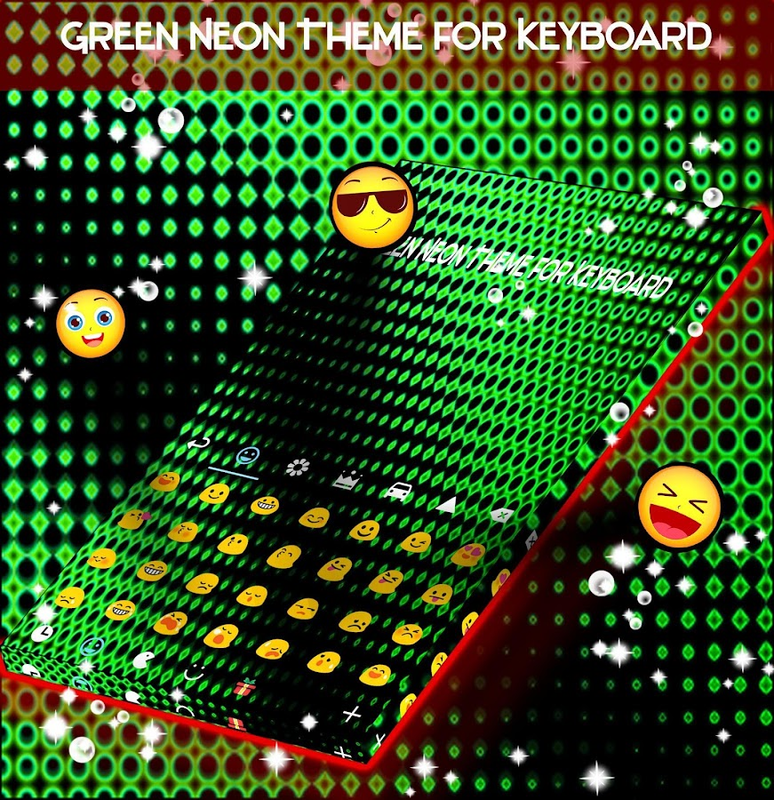 Installation is easy and the steps to activatethe keyboard are very easy!✧★★★ How to install and use Green NeonTheme for Keyboard★★★• Make sure you have GO Keyboard - Emoji,Wallpaper or New 2018 Keyboard installed on your Android phone ortablet.• Download Green Neon Theme for Keyboard • Open the newkeyboard theme and select "Set as Active Theme"• Start using thenew free keyboard theme!★ Notice ★ If you do not have GO Keyboard -Emoji, Wallpaper or New 2018 Keyboard installed yet, not to worry,you will be redirected to a download page where you can install thecompatible keyboard!✧ Do you want more themes for keyboard?✧ Visitour developer page and download more free keyboard themes!◆ Contactus [email protected] if you have any theme requests! We’realways looking to publish amazing new free keyboard themes forAndroid! Stay connected with us on social media and you will findout when we publish new themes for keyboard. Our latest flaming keyboard is one of the coolest you will findtoday: Neon Keypad Theme! DOWNLOAD Neon Keypad Theme now andwitness these brilliant flames on your phone!★★★ Our new NeonKeypad Theme will change the background of your keyboard with itsunique design and amazing color. With keyboard themes for Androidyou can personalize the smartphone keyboard. Try one design and seehow new keyboard themes can transform your phone! You can see howthis theme looks in the HD screenshots we added. This is one of thekeyboard themes for Android that is compatible with most smartphoneversions, it will look amazing on your Android device.★★★✧ Giveyour standard keyboard a new look ! This keyboard theme will changethe look and shape of the keyboard buttons, so now it is easier towrite.✧✧ Get this keyboard theme and start using it instantly!Installation is easy and the steps to activate the keyboard arevery easy!✧★★★ How to install and use ★★★• Make sure you have GOKeyboard - Emoji, Wallpaper or Redraw Keyboard Emoji & Themesinstalled on your Android phone or tablet.• Download our NeonKeypad Theme • Open the application and select "Set as ActiveTheme" • Enjoy your new free keyboard theme!• Don’t forget to rateand review! We love reading your feedback!★ Notice ★ If you do nothave GO Keyboard - Emoji, Wallpaper or Redraw Keyboard Emoji &Themes installed yet, not to worry, you will be redirected to adownload page where you can download the compatible keyboard!✧ Doyou want more themes for keyboard? ✧ Visit our developer page anddownload more free keyboard themes!✧✧ Sending text messages justbecame even more fun!✧◆ Get even more themes on our developer page,or contact us if you have any theme requests! We’re always lookingto publish amazing new free keyboard themes for Android! Stayconnected with us on social media and you will find out when wepublish new themes for keyboard. Take a second to enjoy this brand new keyboard our designerscreated just for you: Keyboard for Sony! DOWNLOAD Keyboard for Sonynow and bring these cool colors to your phone!★★★ The new Keyboardfor Sony will change the background of your keyboard with a uniquedesign and amazing color. With keyboard themes for Android you canpersonalize the smartphone keyboard. Try one design and see how newkeyboard themes can transform your phone!★★★★★★You can see how thistheme looks in the HD screenshots we added. This is one of thekeyboard themes for Android that is compatible with most smartphoneversions and will look amazing on your Android device.★★★✧ Giveyour standard keyboard a new look ! This keyboard theme will changethe look and shape of the keyboard buttons, so now it is easier towrite.✧✧ Get this keyboard theme and start using it instantly!Installation is easy and the steps to activate the keyboard arevery easy!✧★★★ How to install and use Keyboard for Sony★★★• Makesure you have GO Keyboard - Emoji, Wallpaper or New 2018 Keyboardinstalled on your Android phone or tablet.• Download Keyboard forSony • Open the new keyboard theme and select "Set as ActiveTheme"• Start using the new free keyboard theme!★ Notice ★ If youdo not have GO Keyboard - Emoji, Wallpaper or New 2018 Keyboardinstalled yet, not to worry, you will be redirected to a downloadpage where you can install the compatible keyboard!✧ Do you wantmore themes for keyboard?✧ Visit our developer page and downloadmore free keyboard themes!◆ Contact us [email protected] ifyou have any theme requests! We’re always looking to publishamazing new free keyboard themes for Android! Stay connected withus on social media and you will find out when we publish new themesfor keyboard. We know how much you like Luxury Gold Keyboard Theme to beautifyyour mobile gadget and that is why we created Luxury Gold KeyboardTheme designs that will blow your mind! Luxury GoldKeyboard Theme will bring your phone a new look. You’ll fall inlove with this Luxury Gold Keyboard Theme for sure. Luxury GoldKeyboard Theme will let a plain keyboard into a beautiful andunique one. Decorate your phone with Luxury Gold KeyboardTheme now! If you need a special keyboard style for your newmobile device then you must try this amazing Luxury Gold KeyboardTheme. You will not regret a minute spent on this Luxury GoldKeyboard Theme design because you'll draw everyone's attention. Bethe new trendsetter among your friends, download Luxury GoldKeyboard Theme for free! Luxury Gold Keyboard Theme is compatiblewith most Android phones, including but not limited to:SamsungGalaxy Note7, Note 6, Note 5, Samsung Galaxy S7 and S7 Edge,Samsung Galaxy S6 and S6 Edge, Samsung Galaxy S5, Samsung GalaxyJ7,Samsung Galaxy S8 and S8 Edge;Sony Xperia Z5, Sony XperiaZ4;Huawei P10 and P10 Plus, Huawei P9, Huawei P8, Huawei Mate 9,Huawei Mate 8, Huawei Honor 8;HTC 10, HTC One A9, HTC Desire 10Pro;OPPO Find 9;Xiaomi Mix, Xiaomi 6, Xiaomi 5;Nokia 8 ✨How toUse the Luxury Gold Keyboard Theme Keyboard： * Note: Pleaseinstall our keyboard first. * Download the Luxury Gold KeyboardTheme from play store. * Open Luxury Gold Keyboard Theme and clickthe ACTIVATE THEME button. * Kika theme Keyboard that has beenloved deeply by over 20 million users is the most personalizedkeyboard with themes for Android! * Kika keyboard provides manyfree and stylish keyboard HD wallpapers to decorate your phonebackground, like anime HD wallpaper, cute HD wallpaper, emojis HDwallpaper and so on. ✨What makes you want to try smart typing? ✨What makes you feellikechanging the tedious keyboard? Check out and downloadtheseLuminous Digital themes. 😘Start a new typing style and tryadifferent keyboard.👉This is a set of Luminous Digital themes.Itconsists of not only luminous keyboard element, but alsocoolstyle. The combination of these elements makes theseLuminousDigital themes more distinguishedandpersonalized.Characteristics:This set of themes arecharacterizedby the following:⭐ Both luminous keyboard and coolstyle elementsare presented.⭐ Setting colorful as the backgroundcolor. Thiscolorful color serves as a perfect background to makethe featureof luminous keyboard and cool style elements stand outin theseLuminous Digital themes.⭐CCC element has been applied tohighlightthe characteristics of Luminous Digital theme.How todownload theseLuminous Digital themes?👉To download this set ofLuminous Digitalthemes, you need to download and apply our inputmethod APK. Withthat installed, you can then enjoy these uniqueLuminous Digitalthemes.More benefits for downloading thesethemes:❤️ CloudPrediction function at hand: typing more efficientlywith clouddata powered prediction function to accurately predictyourinput.❤️Gesture Typing: instead of typing one letter a time,justswipe through letters to enjoy easier typing.❤️GIFs: hugeamount offunny GIF images. Typing can be fun.❤️Thousands of themes:themesof various styles including cute, cool, tech and luxury ones,etc.There is always one for you.❤️Clipboard function available:cutyour input for a quick paste, fast and convenient.Thanks forusingour themes. You can show your favor and support by givinggreatratings. Thanks! ✨Os12 Keyboard Theme with new cool fonts and fun emojis is nowavailable! Get this Os12 Keyboard Theme, grab the chance to makeyour phone more stylish and trendy than ever before! 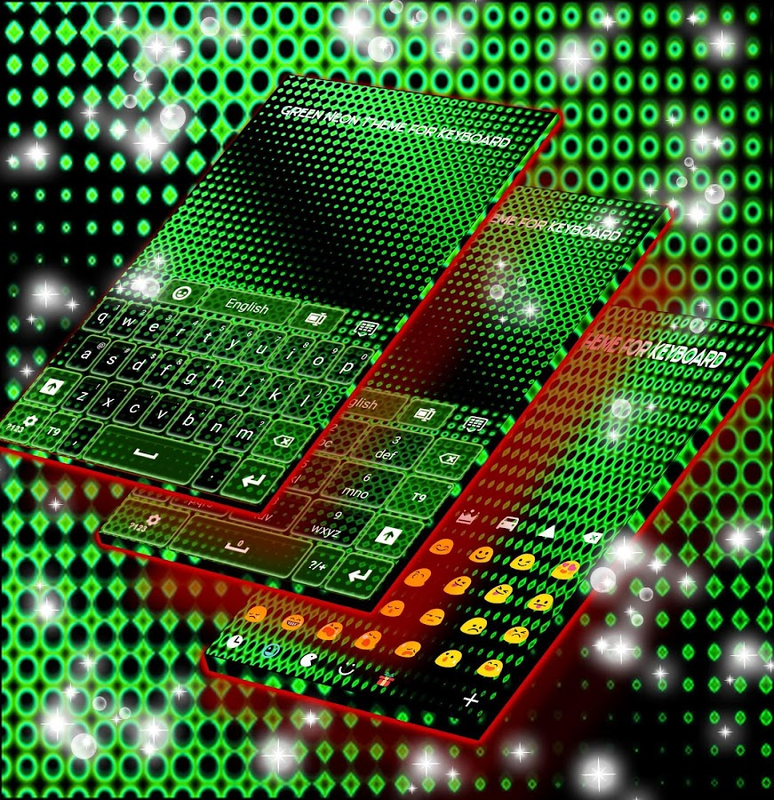 Os12 KeyboardTheme will bring your phone the most fashionable personalizedoptimization. In the meantime, Os12 Keyboard Theme has the mostfantastic typing experience. Download and install Os12 KeyboardTheme for free right now! You will experience unbelievablepleasing, fluent and fast when you type with Os12 Keyboard Theme.Your wish to customize your phone can be satisfied 100 percent byOs12 Keyboard Theme. No doubt you will love Os12 Keyboard Theme.✨How to Use Os12 Keyboard Theme: * Note: Please download andactivate our keyboard first. * Download Os12 Keyboard Theme fromPlay Store and open it. * Click the APPLY button or the previewpicture of Os12 Keyboard Theme. * Bravo! You have installed andapplied Os12 Keyboard Theme. ✨Privacy and Security: We will nevercollect your personal info and collect the photos you set as HDwallpapers. We only use the words typed by you to make thepredictions more accurate. ✨Features including but not limited to:* Gesture typing; * Next-Word suggestion; * Auto correction; *Sticker Suggestion; * Voice input; * Copy, cut and paste straightfrom emoticon keyboard; * A lot more new features improving yourtyping wishing you to experience; * Our Keyboard which has beenloved deeply by over 20 million users support over 150 languagesand still counting; * Our Keyboard is the most personalizedkeyboard for Android with all categories of stylish android themesoffering in our keyboard theme center; * Our Keyboard providesamount of free and perfect stylish & fashion keyboard HDwallpapers to decorate your phone background, like 4K HD wallpaper,cute HD wallpaper, emoji HD wallpaper and so on. For example,glitter HD wallpapers, delicate themes, cool themes, cute themes,animal themes, luxury themes, high tech theme, etc. You can alwaysfind your favorite; * Our Keyboard allows you to customize keyboardtheme by choosing your own photos, HD wallpapers, emojis HDwallpapers, applock pictures or launcher pictures. You can alsochange the theme colors (including background and buttons),customize the font styles, fonts sizes and colors! Be the designeryourself, hold your own style; * Our Keyboard is compatible withalmost all android phones, including Samsung (S Series like S9, S9+, S8, S8 +, etc. ; Note Series like Note 8, Note 7, etc. ), Huawei,Honor, LG, HTC，OPPO, VIVO, Smartisan, XIAOMI, MEIZU, One Plus,Lenovo, Moto, etc. ✨Add Os12 Keyboard Theme in your phone! Let Os12Keyboard Theme show its unique charm, your phone can be reallydifferent with Os12 Keyboard Theme. Install and apply Os12 KeyboardTheme right now!